The Pound managed to eke out some gains against its major peers on Thursday, after the Bank of England hinted that it could raise interest rates in the UK, should Theresa May manage to force a Brexit deal through parliament. ommunications out of the BoE yesterday were fairly mixed. Sterling had initially fallen after Governor of the Bank of England Mark Carney talked up the downside risks to growth posed by Brexit. Policymakers slashed their GDP growth forecasts for this year to just 1.2% from the previous 1.7% estimate. Carney also stated during his press conference that under a worst case ‘no deal’ Brexit, there would be a sudden loss of confidence in the UK among foreign investors, which could send the UK into recession. Losses for the UK currency were, however, quickly reversed after Carney opened the door to an interest rate hike later in the year. Carney said that the markets were right to keep the possibility of a hike on the table and that the UK economy would rebound under a softer Brexit. We think that the upward move in the Pound is indicative of the general optimism that markets currently have regarding an eventual passing of the Brexit deal. Under our base case scenario of a delayed, albeit successful and somewhat orderly EU exit, we still think that the Bank of England will raise interest rates towards the end of this year. This would be unambiguously positive for the Pound. 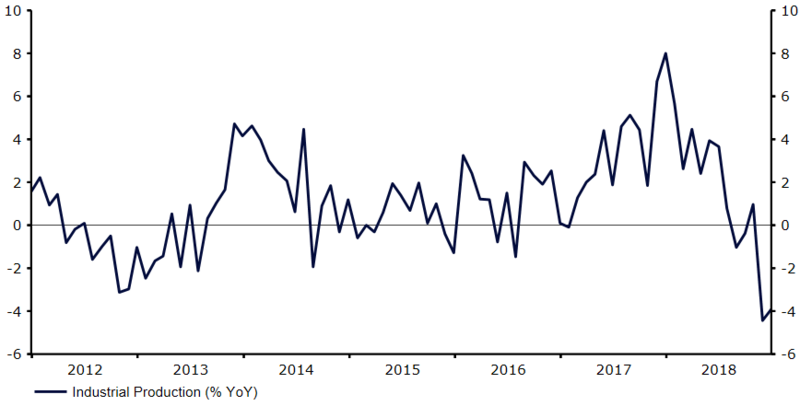 The sell-off that we’ve witnessed in the EUR/USD rate this week can largely be attributed to the recent soft economic data out of the Euro-area. German industrial production numbers out on Thursday were particularly troublesome. Output in the industrial sector of Europe’s largest economy contracted again in December by 0.4% and by a sizable 3.9% year-on-year (Figure 1). Retail sales in Italy, which entered into its first recession in five years in Q4 2018, also came in negative, while the European Commission once again downgraded its growth forecasts for the Euro-area’s economy. The EC now expects the bloc to expand by just 1.3% this year, down from 1.9% last year. This is considerably below the levels that are conducive of higher interest rates from the European Central Bank. Today looks set to be a relatively quiet one in terms of economic news, with no major releases scheduled out of the US at all today. We will instead tentatively turn our attention to major US news out next week, namely the delayed US inflation and retail sales numbers. If, as much of the market expects, data out of the world’s largest economy begins to turn south, we could see the EUR/USD rate retrace some of its losses in the coming sessions.